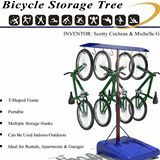 We have invented a free standing 8 unit, bicycle storage tree. It has been safely tested to hold over 250 lbs. The bicycle storage tree is portable and requires no drilling or installation damage to the garage or walls. The durable design will last for years inside the home as well as outside the home. It is very easy to use and can be safely used by people from ages 9-90!!! One of the most common offenders in garage clean up and storage is bicycles. Their odd shape makes it hard to store them out of the way. The storage tree allows a mess of 8 bicycles to be stored in an area of about 4'x7' area along a wall or corner of the garage. Our projected price is $80-$100 per unit. We believe this will be very affordable for all income classes of people. We also feel this could be a great impulse buy in stores since almost all storage products for bicycles have to be ordered online. This product can be easily compared to products that are on the market already with this product being a better, more affordable, more usable design than similar products being sold at Menards already. This product can be viewed on our link at Link for more information. Page created at 2019-04-25 10:05:28, Patent Auction Time.